DETROIT - Attorneys for people suing air bag maker Takata and five automakers say the car companies knew that the company's products were dangerous yet continued to use them for years because they were inexpensive. The allegations against Honda, Toyota, Nissan, Ford and BMW were made in a document filed Monday with a federal court in Miami. The court is handling pretrial evidence-gathering in dozens of lawsuits against Takata and the automakers. The document says the allegations are partly based on auto company documents. Earlier, the automakers had contended that Takata was the problem because it admitted to covering up the defective inflators, which can blow apart and hurl shrapnel into drivers and passengers. Takata is expected to enter a guilty plea to one criminal charge at a hearing in Detroit Monday. The company responsible for selling defective airbags has pleaded guilty to a federal fraud charge. At a press conference in Detroit, Sandra Moser with the U.S. Department of Justice said Takata willfully manipulated test data to make it look as if its airbags were safe, and sold them to automakers intentionally. “Takata was supposed to be selling products that save lives,” Moser said. “Not pushing into the marketplace products increase the risk of harm to consumers." 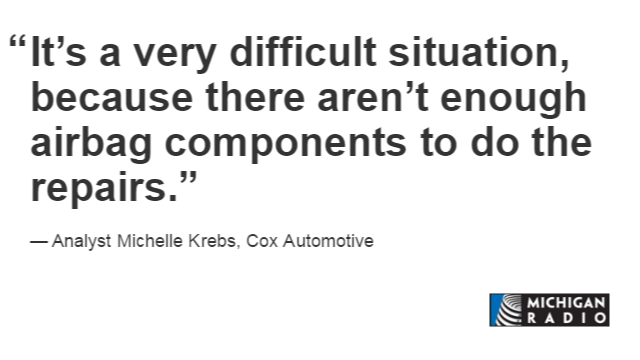 Every recall is a safety recall, as one of my favorite auto industry analysts, Michelle Krebs of Autotrader says. But there is a lot of recall fatigue out there. And it's dangerous. Autotrader's recent survey finds that 40% of people are ignoring recalls because they think the recall is "not important." So let's cut through that recall fatigue right now. The largest recall in automotive history just got bigger. General Motors and Ford Motor Company this week recalled nearly four million cars with passenger-side Takata airbags. Takata airbags can inflate with too much force, especially if the cars have been driven in hot, humid areas for a long time. Automakers have added another 12 million cars to a massive recall involving defective airbags. 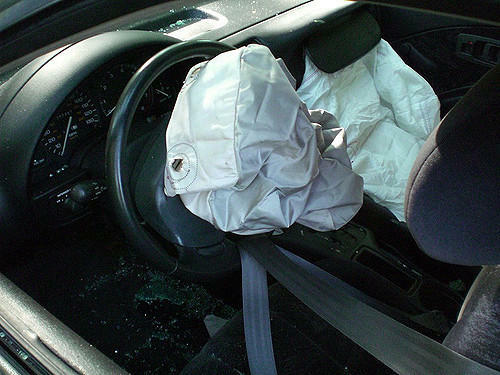 Takata-made airbags can inflate with too much force and explode. Shrapnel from the devices has killed 13 people, 10 of those in the United States. More than 100 people have been injured. The total number recalled over the defect is now about 36 million cars in the U.S. and 70 million globally. Twelve of the fatal accidents have occurred in Honda vehicles. One death occurred in a Ford pickup in Georgia in December, 2015. As vehicles grow older, how safe are their airbags? Listen to our conversation with Paul Eisenstein. There have been at least eight people killed in accidents related to defective airbags made by Takata. The potential number of vehicles affected by these Takata air bags has been boosted to more than 32 million, according to the National Highway Traffic Safety Administration. 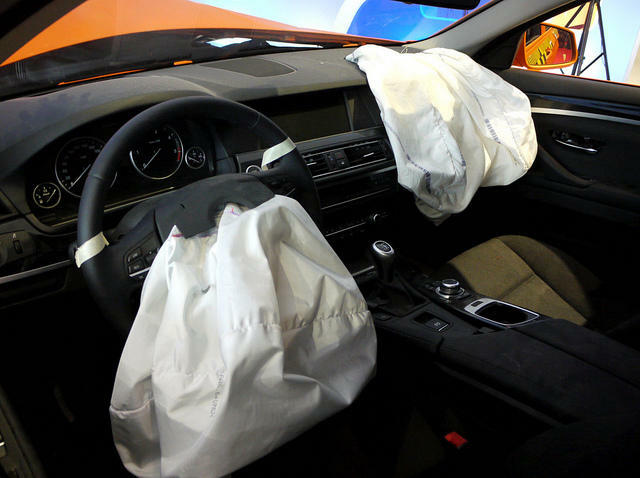 But the watchdogs at NHTSA are keeping a wary eye on another safety issue brewing with airbags. What happens when airbags age? The average age of vehicles on the road is more than 11 years old, and according to auto journalist and publisher of TheDetroitBureau.com Paul Eisenstein that's the oldest average age we've ever experienced.